Mobile apps are developing into a primary digital channel for many reasons:- Almost 70% of all cell phone holders in America keep checking their mobile devices even when there’s no sound or vibration signal. - About a half of all cell owners sleep right next to their mobile device so as not to miss any notifications, calls or messages during the night. - 30% of cell phone holders can’t imagine their lives without such a thing as a smartphone. - 79% of cell phone users text message, and of these, 70% get unwanted text messages and intrusive spam. It’s a problem on a weekly basis for 25%. As you see, a mobile phone is actually an extension of your potential customer – it’s extremely personal and immersive compared to any other media channel. Therefore, marketers need to be aware of this highly dynamic digital channel targeted at building an intimate and deep connection with the customers. Smartphones can accumulate relevant information about your audience, and improve customer acquisition/retention with highly personalized data. The type of connection we used to build face to face is now available through technical tools – isn’t that amazing? Mobile marketing is also the leading engine behind inbound marketing. 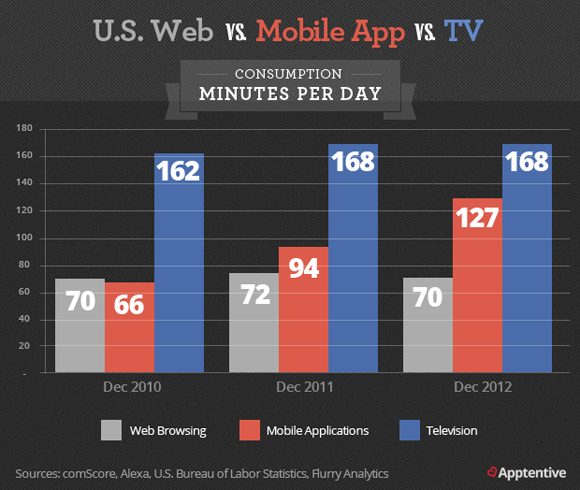 People already spend more time using mobile apps than they do browsing on a desktop and only TV remains a more important media consumption channel. But mobile app promotion is not just about buying and placing more mobile advertisements or finding new customers. Instead, you can focus on engaging your existing app users with relevant notifications and valuable content. - There are many apps out there, and the recent changes in AppStore ranking mechanisms (correlating the number and quality of reviews with retention rates) have made it even harder to get to your customers through the app marketplace. It’s no longer the era of getting rich very quick with a great mobile app, and very few customers come back to an app and stay loyal – ¾ of lost customers are gone for good! Since people install excess apps on a daily basis, the installation number is not the only parameter that mobile marketers need to rely on. - The crucial engine of customer retention is extending the lifetime value of the product. Mobile marketers also need to keep in mind the average avenue per app user. - In spite of the number of apps out there, very few companies (especially medium and small businesses) have taken advantage of the mobile app opportunities. With websites it’s 2014 but in terms of mobile web development it’s the 2000s again. - An increasingly satisfied client base who actively recommends, shares and gives good reviews in the app marketplace. Word-of-mouth marketing still works great. - Customers you know much better because you’ve learned more about their reactions, language, values and necessities. You’ll be able to use this knowledge in other marketing channels as well. 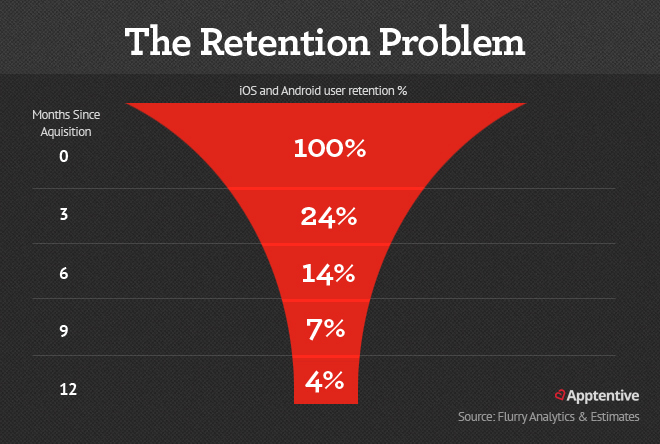 This is why customer retention is so important for mobile app marketing. And what are your ways of keeping up retention? Share your experience and thoughts in the comments.